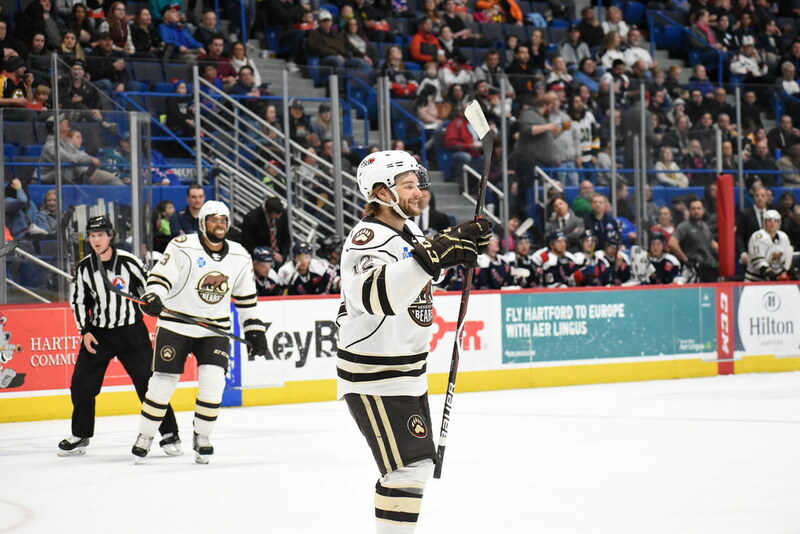 The Hershey Bears downed the Hartford Wolf Pack 6-3 Friday night at the XL Center in Hartford. The win improves the Bears record to 41-25-4-4 (90 points) on the season, and secures a first-round matchup with the Bridgeport Sound Tigers. The Bears closeout the regular season with a pair of home games, starting with the Utica Comets on Saturday. Puck drop is set for 7:00 PM at Giant Center. Scratches: Kris Bindulis (upper body), Garrett Pilon (lower body) and Riley Barber (upper body) were the injury scratches. Hampus Gustaffson, Juuso Ikonen, and Tobias Geisser were the healthy scratches. Ilya Samsonov was recalled by the Capitals on Thursday April 11th. As a result, Adam Morrison was recalled from the Carolina Sting Rays. The Bears would open the scoring with a goal from Steve Whitney at 6:51 of the first period. Connor Hobbs (16) was credited with the lone assist. But the Wolf Pack would answer on the ensuing faceoff, just nine seconds later, with a goal from Jake Elmer to tie the game at the 7:00 mark. The Bears would retake the lead with a power play goal from Mike Sgarbossa at 9:18 of the first period. This was Sgarbossa’s 30th goal of the season. Aaron Ness (47) and Devante Smith-Pelly (7) were credited with the helpers. The Bears would stretch their lead to 3-1 with a power play goal from Nathan Walker at 14:12 of the first period. Walker would redirect a shot from the point by Aaron Ness. Aaron Ness (48) and Mike Sgarbossa (33) had the assists. The opening frame would end with the Bears leading 3-1. The Wolf Pack led in shots on goal 14-10 for the first 20 minutes. The Bears were 2 for 2 and the Wolf Pack were 0 for 2 on the power play. The Bears would make it 4-0 with a beautiful tic-tac-goal, finished by Steve Whitney at 7:42 of the middle frame. Joe Snively started the play from below the goal, passed to Mike Sgarbossa, who dished to Whitney for the finish. Hartford would get one back with a power play goal from Ville Meskanen at 13:03 of the second period. Nathan Walker would restore the Bears three goal lead with a fortunate backhander from the right corner at 16:46 of the second period, making it 5-2 Bears. The second period would end with the Bears leading 5-2. Hershey outshot Hartford 13-6 in the middle frame, and led 23-20 after 40 minutes of play. The Bears were 2 for 2 and the Wolf Pack 1 for 4 on the power play after two periods. The Wolf Pack would get one back with a tally from Jake Elmer, just 1:42 into the final frame, making it 5-3 Bears. But the Bears would get it right back with a goal from Ryan Sproul at 3:07 of the final frame. Jayson Megna (23) and Nathan Walker (21) had the assists. The Bears would hold on for the 6-3 win. Nathan Walker had two goals. Steve Whitney had two goals. The Wolf Pack outshot the Bears 35-31 for the game. This entry was posted in News and tagged Hartford Wolf Pack, Hershey Bears, Jon Sorensen, Mike Sgarbossa, Nathan Walker, Ryan Sproul, Steve Whitney. Bookmark the permalink. Indeed. Thought he might get a callup. 30 goals is impressive.